I love physical books, but my favorite thing about Kindle books is the highlight feature. It’s really hard to remember everything that you read. This is why I try to condense my handwritten notes in my book reviews. I’ll let The Atlantic explain Why We Forget Most of the Books We Read. 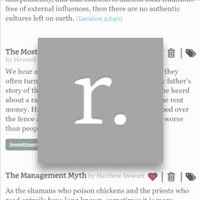 Readwise syncs with your Kindle highlights and then sends you a daily digest with five highlights taken from books that you have read. You’ll need to install a browser extension. It can include Kindle highlights done outside of eBooks, iBooks, Instapaper, and PDFs. Here’s an example of what I was sent the other day. (I scaled it back to weekly emails.) Much of my reading is about either finance or biographies. A lot of personal finance is in the “simple but not easy” category, so it’s helpful to keep things fresh. Some of the highlights lack context, but I have found most to be useful. The Elements of Investing by Burton G. Malkiel, Charles D. Ellis. Rebalancing will not always increase returns. But it will always reduce the riskiness of the portfolio and it will always ensure that your actual allocation stays consistent with the right allocation for your needs and temperament. Skating Where the Puck Was by William J Bernstein. To complete the picture, the traditional source of portfolio diversification, international equity exposure, has likewise tarnished; with increasing market globalization, the correlations among equities around the world have crept ever higher. The Most Important Thing by Howard Marks. The Last Lecture by Randy Pausch and Jeffrey Zaslow. “…The brick walls are there to stop the people who don’t want it badly enough. They’re there to stop the other people.” I was a thirty-seven-year-old bachelor when Jai and I met. How does Readwise make money? From what I can tell, right now it is free during “beta”. They have a VIP level that cost $5 a month or $50 a year. I don’t think I would pay that much, to be honest. My suggestion? At the end of each email, they provide a book recommendation along with a quote. They should make that an Amazon ad, seems like a perfect fit. Bottom line. If you have a decent library of Kindle highlights, check out Readwise and let it dig up nuggets of gold and send it to you daily or weekly. Get more mileage out of those notes and highlights.